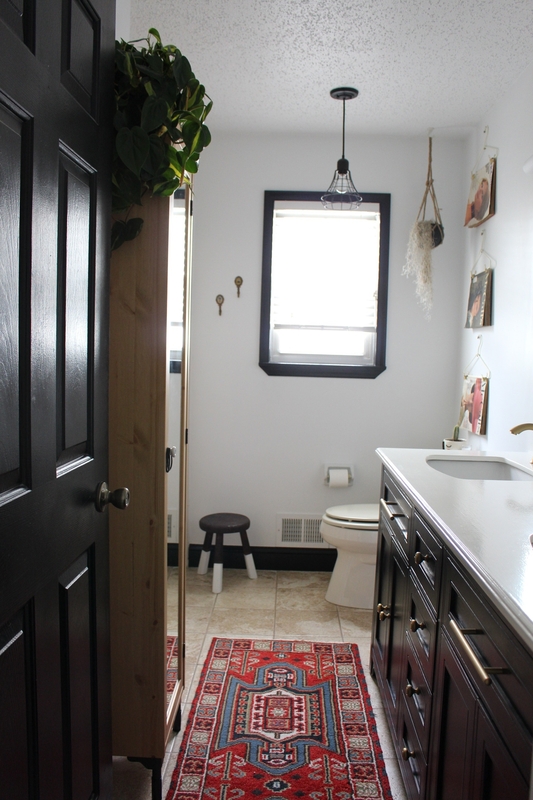 Bathrooms are a part of the house that tend to go untouched. 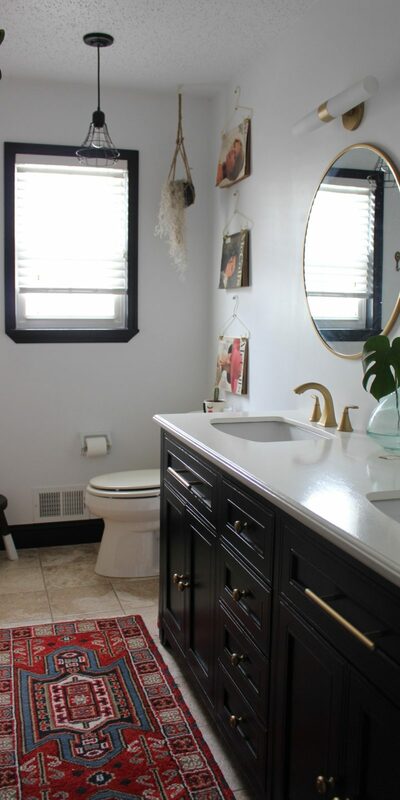 One of the main reasons you may avoid sprucing up your bathroom might be the cost factor. 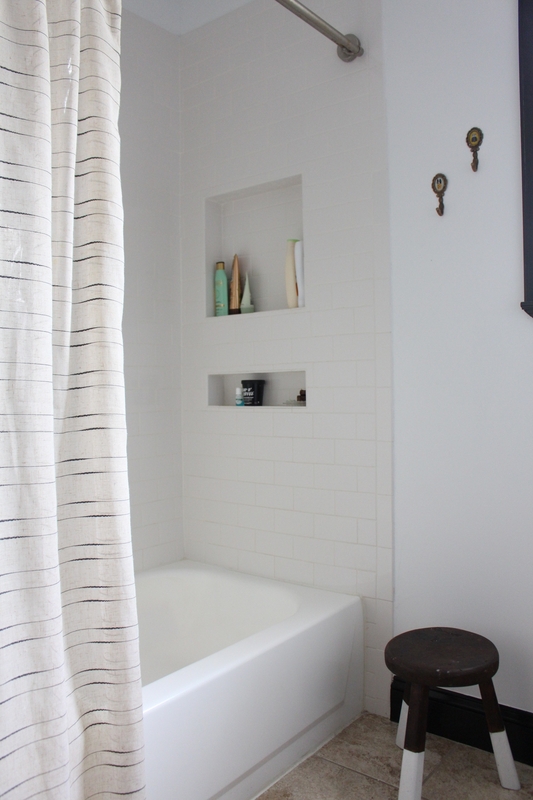 There are a ton of ways everyone can do some updating in their bathroom and you can even do it yourself. You can buy a kit to refinish the tub however, I do suggest getting some help with it because I heard it can be pretty difficult. We hired someone to do it for us. 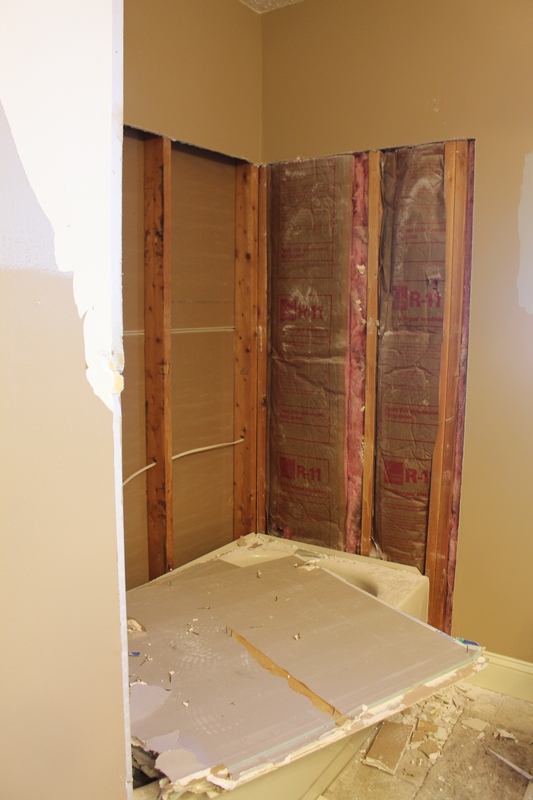 Mike and I did some DIY work in our upstairs bathroom. We split the work up within a couple of months. 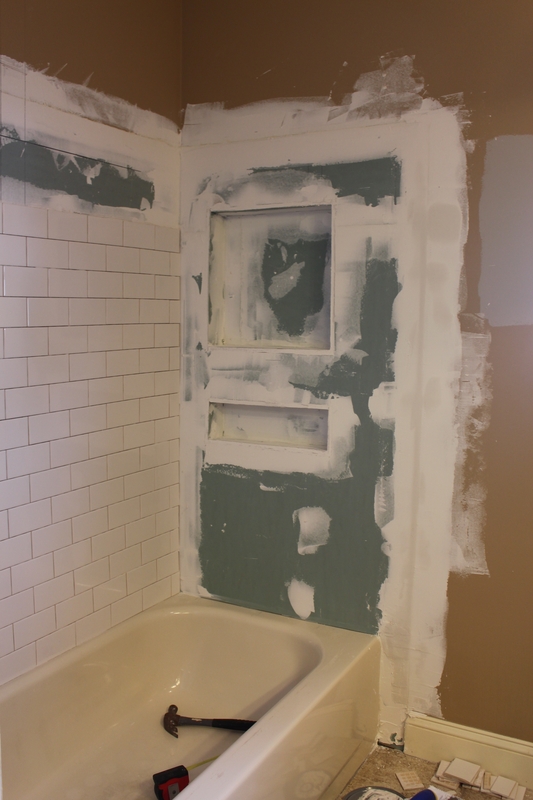 First, we did the tiles in the shower. After we did the tiles we got our fiber glass tub glazed. We did the tiles first because we didn’t want to ruin the glaze as we demoed the tiles. 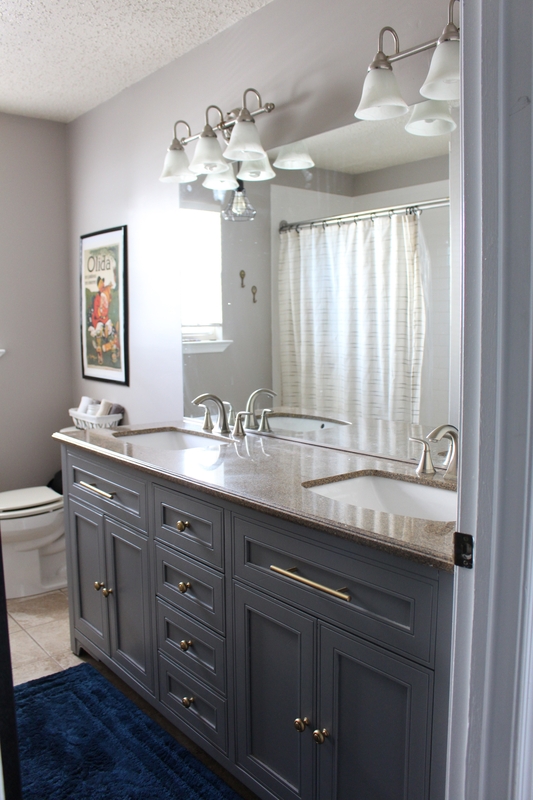 After about two months we finished up by painting the walls, the vanity, and the trim. 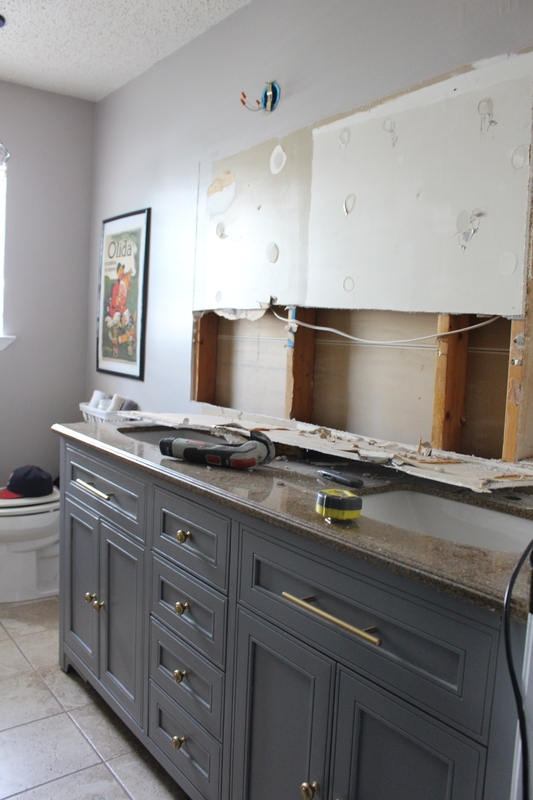 This is during the tile DIY. You can see the old tub here. Eek! 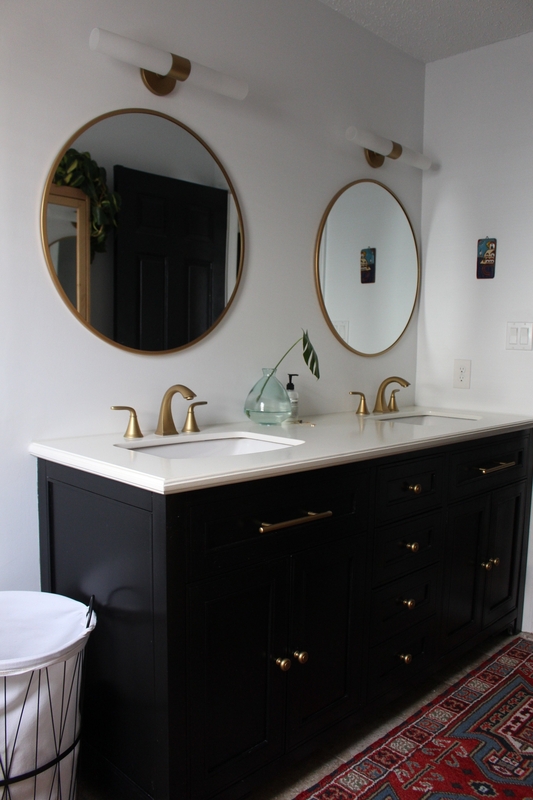 I painted the vanity twice, actually. The gray color you see in the before photos was the first time I painted it. I love the contrast of the black which I why I painted it again. I used Behr paint from Home Depot. We also spray painted the handles which is another cost friendly option if you’re not quite ready to buy a whole new set. This is cost friendly however it may not last forever. If you’re going to spray paint your handles I HIGHLY suggest spraying them with Polycrylic after the spray paint to protect them. They are going to get a ton of use and will probably fade a little bit. This is a great option until you’re ready to buy a new set. 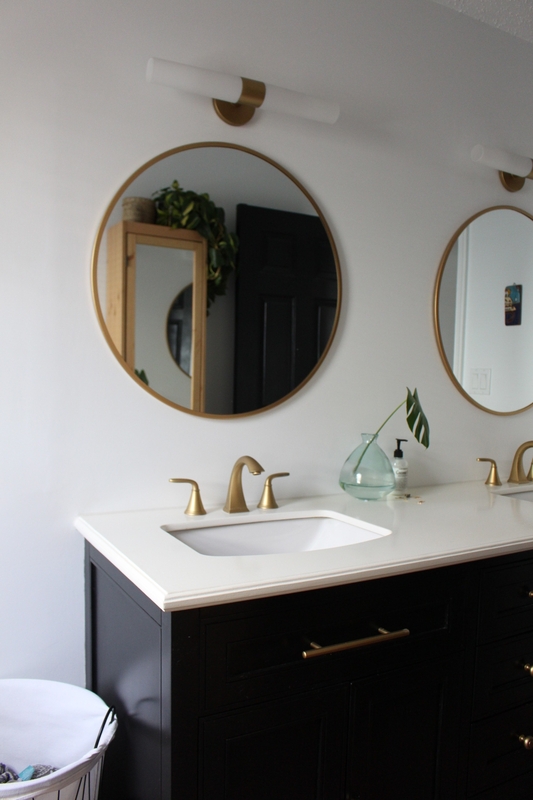 We used Rustoleum Counter Top Paint to make our vanity counter top white. We had all of the tools at home to do so but Home Depot does carry counter top kits that include everything. Before attempting this let me give you some warnings. First, the smell of the fumes are STRONG! Be prepared to have all windows open and fans on. 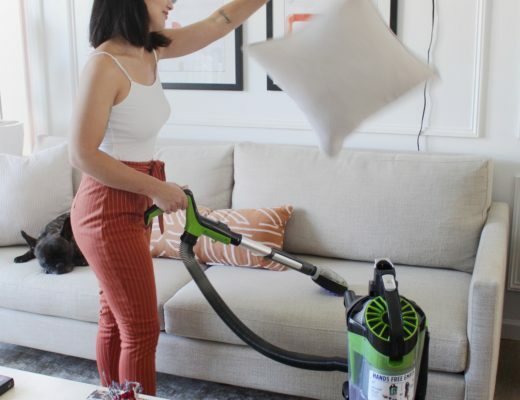 If you have any kids or pets in the home please be careful that they aren’t inhaling the fumes because they are very strong! You also have to allow this to dry for quite some time. We tried to put items on the counter way too soon and left a couple dents in it. I have to say it probably took about 2-3 weeks to REALLY harden. All in all I am so pleased with it. The white counter is beautiful and bright. In order to protect it we also used the Polycrylic on this. If you’ve never used Polycrylic before I don’t suggest trying it for the first time on this project. Polycrylic dries fast so you really have to get it right the first time. 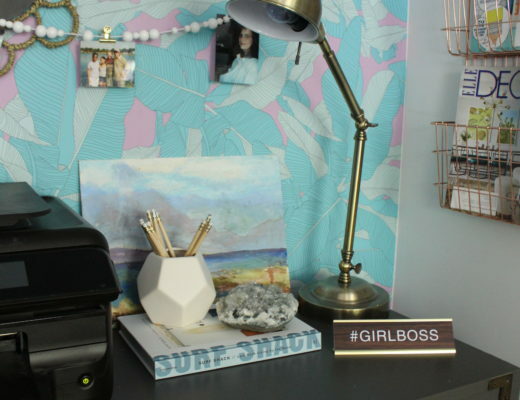 Okay, let’s talk decor! The Turkish rug I found at Home Goods really makes this space! I kept trying to use typical bath mats and it just wasn’t doing it for me. The red color and pattern against the black and white just pops! 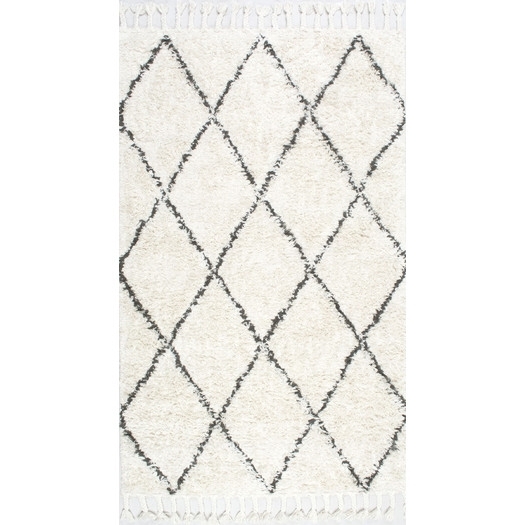 I never even knew Home Goods carried these kind of rugs but it was a pleasant surprise. 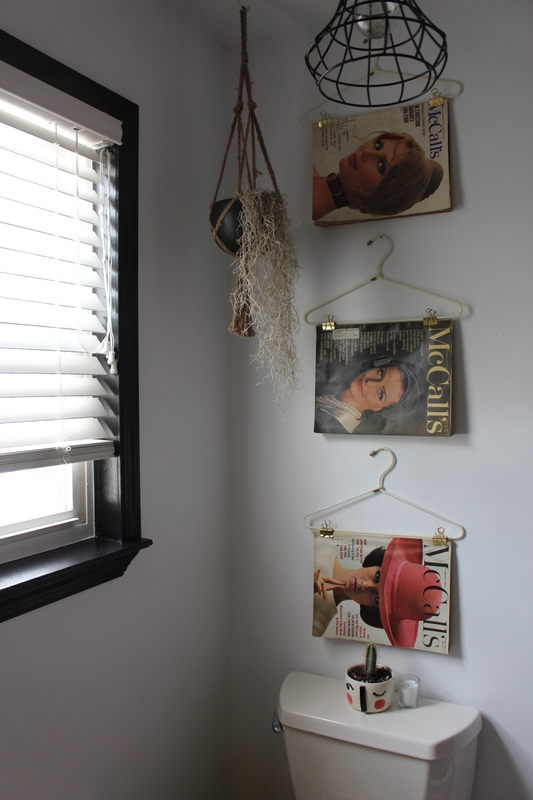 I also hung my vintage McCall’s fashion magazines above the toilet with hangers and binder clips. I had to find hangers that would hold the magazines (they’re bigger than regular mags). I found these at Home Goods as well. If you want to create your own hanger gallery, Home Goods has great options for pretty hangers. The little stool in the corner was a thrift store find. I found it for a couple dollars. I decided to stain it and paint the legs white to spruce it up a little. You can see in the reflection of the mirrors in one of the photos below, the IKEA cabinet we put in the bathroom. This will keep all your personal things off the counter and keep your bathroom clean and simple. I hope you got some ideas from our bathroom. I also hope you’re feeling brave enough to try some DIY! If you ever have any questions about DIY you can comment here or comment on my Instagram. Have fun. OOOH i love everything you did. 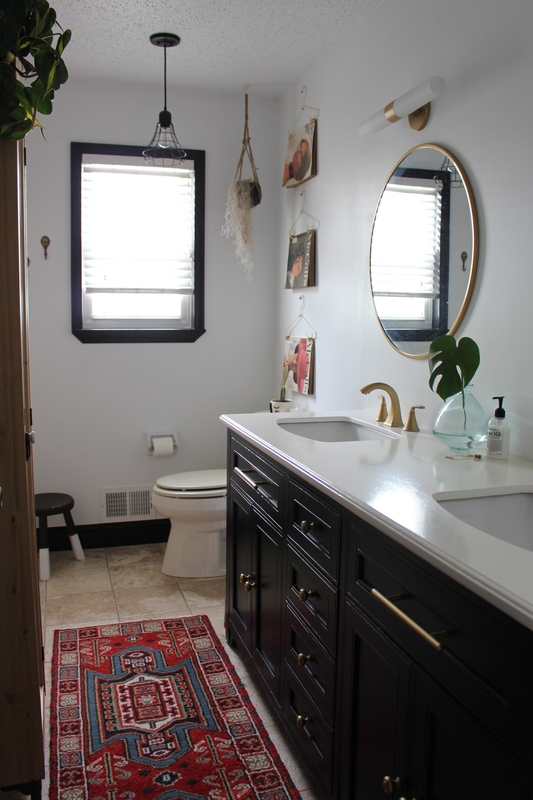 Amazing job!…and YES you gave me lots of ideas for my bathroom. Thanks a million. Thank you so much, Nichol! !